It is sometimes difficult to tell just by looking at a passive vs active adapter, but you will know right away by the price. A passive adapter can cost as little as $12. A quality ACTIVE video adapter on the other hand will cost about $30. A passive adapter is the most basic type of adapter that can purchased. A passive DisplayPort adapter merely allows the GPU to communicate with a “language” that can be understood by the attached monitor, which has a differing connector. 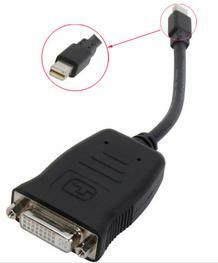 As an example, using a passive adapter to connect a DVI monitor to a video card with a DisplayPort connection will essentially cause that DisplayPort output to communicate with the “language” of DVI. As far as the video card is concerned, it does not have a DisplayPort monitor connected, and therefore cannot leverage the benefits that DisplayPort enables (e.g. AMD Eyefinity technology and 4k resolutions). In contrast, ACTIVE adapters will actively translate the DVI signal coming from the monitor into a native DisplayPort signal for the video card (and vice versa). Use all the same exact make, model monitors if you can. At the very least use monitors in even PAIRS as described above.